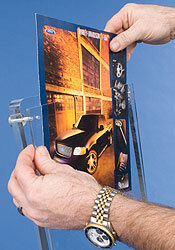 Holds an 8-1/2" x 11" standard sized graphic! Acrylic faceplate features attractive silver aluminum knobs! Pocket has three different display capabilities! 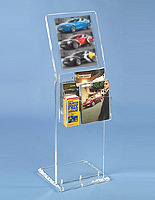 This catalog rack, also known as an acrylic literature display, is ideal for special promotions, advertisements, or as a point of purchase display! 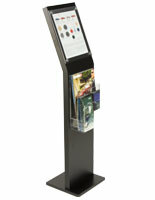 Our catalog rack is perfect for environments such as universities, malls, car dealerships, or business organizations! 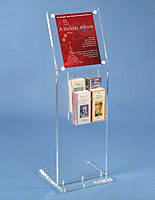 The catalog rack has a 3/16" acrylic face plate for holding 8-1/2"w x 11"h graphics. 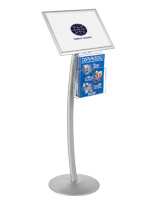 The acrylic brochure pocket can be configured to hold (2) tri-fold brochure holders side-by-side, full-size catalogs, or combinations of the two. Simply remove the acrylic divider pin to change the pocket sizes! 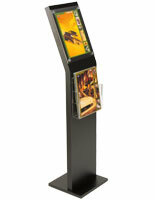 This catalog rack matches every décor and is sure to catch the attention of everyone passing by! 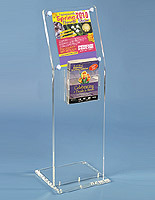 This catalog rack, literature display is made of 1" clear acrylic with a thick, heavy base. Satin finish aluminum screw caps accent the stand while securing the face plate. To change the graphic on this catalog rack, simply unscrew the top caps from the threaded studs and center your insert behind the face plate. 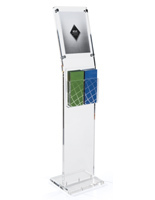 This catalog rack, also known as a contemporary brochure stand comes unassembled but takes only minutes to set up. 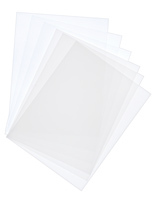 12.0" x 47.5" x 19.0"
It looks great, is sturdy and not too bulky. Fits perfectly in our reception area. 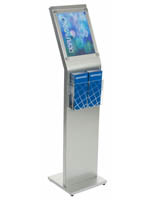 We're so glad this stand works perfectly for your needs, Adrienne! Thanks for shopping with us.